Pictured are front row Bode Davenport, Branson Smithson, Dan Wimberly and Gus Davenport and back row, Russell Davenport. Russell, Shannon, Gus and Bode Davenport would like to congratulate Branson Smithson and Dan Wimberly on their HOME RUNS made in the 2018 season. Branson and Dan both played for the Cubs, coached by Matthew Smith. Both boys made great impact on the mound and proved to be power hitters when at the plate. They have both been active in youth sports for several years. 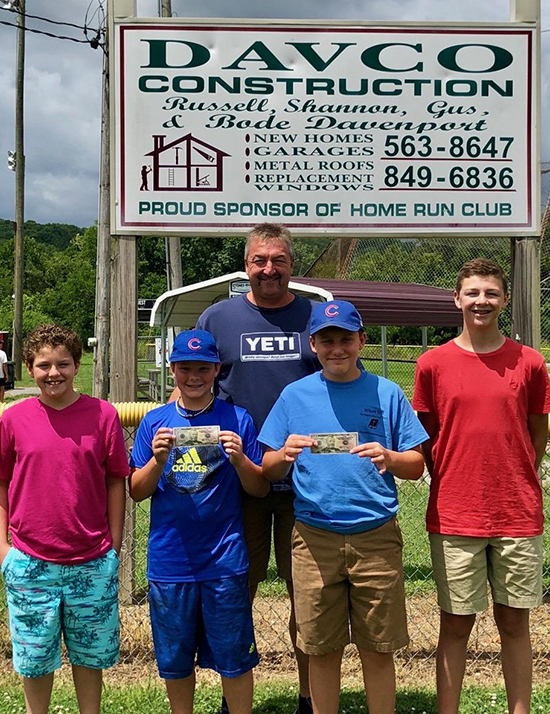 DAVCO Construction has been a proud sponsor of the Home Run Club since 2001. Any player that hits one over the fence is given $50 and their name on the Home Run Club sign at the ballfield. The Home Run Club will also be in effect during the new Fall Ball season that will run September 4th - October 11th. Swing for the fences and Good Luck to all.